MutS, MutL and MutH are the three essential proteins for initiation of methyl-directed DNA mismatch repair to correct mistakes made during DNA replication in Escherichia coli. MutH cleaves a newly synthesized and unmethylated daughter strand 5' to the sequence d(GATC) in a hemi-methylated duplex. Activation of MutH requires the recognition of a DNA mismatch by MutS and MutL (PUBMED:9482749). 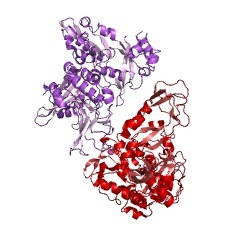 Type III enzymes (EC 3.1.21.5) cleave at sites a short distance from recognition site; require ATP (but doesn't hydrolyse it); S-adenosyl-L-methionine stimulates reaction but is not required; exists as part of a complex with a modification methylase methylase (EC 2.1.1.72). Type II restriction endonucleases (EC 3.1.21.4) are components of prokaryotic DNA restriction-modification mechanisms that protect the organism against invading foreign DNA. These site-specific deoxyribonucleases catalyse the endonucleolytic cleavage of DNA to give specific double-stranded fragments with terminal 5'-phosphates. Of the 3000 restriction endonucleases that have been characterised, most are homodimeric or tetrameric enzymes that cleave target DNA at sequence-specific sites close to the recognition site. For homodimeric enzymes, the recognition site is usually a palindromic sequence 4-8 bp in length. Most enzymes require magnesium ions as a cofactor for catalysis. Although they can vary in their mode of recognition, many restriction endonucleases share a similar structural core comprising four beta-strands and one alpha-helix, as well as a similar mechanism of cleavage, suggesting a common ancestral origin [(PUBMED:15770420)]. However, there is still considerable diversity amongst restriction endonucleases [(PUBMED:14576294), (PUBMED:11827971)]. 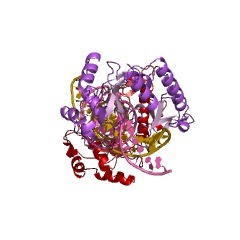 The target site recognition process triggers large conformational changes of the enzyme and the target DNA, leading to the activation of the catalytic centres. Like other DNA binding proteins, restriction enzymes are capable of non-specific DNA binding as well, which is the prerequisite for efficient target site location by facilitated diffusion. 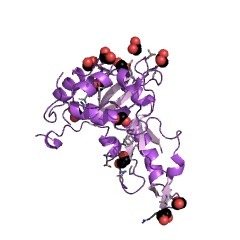 Non-specific binding usually does not involve interactions with the bases but only with the DNA backbone [(PUBMED:11557805)]. 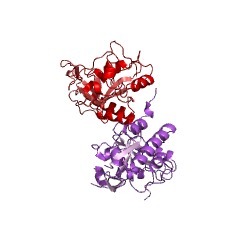 This entry represents restriction endonucleases EcoRV, NaeI, HincII, and Sau3AI, as well as the DNA mismatch repair protein MutH, which are closely related in sequence and structure. EcoRV recognises the DNA sequence GATATC and cleaves after T-1 [(PUBMED:15170321)], NaeI recognises GCCGCC and cleaves after C-2 [(PUBMED:10856254)], HincII recognises GTYRAC and cleaves after the pyrimidine Y [(PUBMED:15476804)], and Sau3AI recognises GATC and cleaves prior to G-1 [(PUBMED:11316811)]. MutH, along with MutS and MutL, is essential for initiation of methyl-directed DNA mismatch repair to correct mistakes made during DNA replication in Escherichia coli. MutH cleaves a newly synthesized and unmethylated daughter strand 5' to the sequence d(GATC) in a hemi-methylated duplex. Activation of MutH requires the recognition of a DNA mismatch by MutS and MutL. With sequence homology to Sau3AI and structural similarity to PvuII endonuclease, MutH shows sequence and structural similarity with PvuII and Sau3AI, indicating a strong relationship with these enzymes through divergent evolution, suggesting that type II restriction endonucleases evolved from a common ancestor [(PUBMED:9482749)]. There are 1748 MutH domains in 1747 proteins in SMART's nrdb database. Taxonomic distribution of proteins containing MutH domain. This tree includes only several representative species. The complete taxonomic breakdown of all proteins with MutH domain is also avaliable. Click on the protein counts, or double click on taxonomic names to display all proteins containing MutH domain in the selected taxonomic class. Structural basis for MutH activation in E.coli mismatch repair andrelationship of MutH to restriction endonucleases. MutS, MutL and MutH are the three essential proteins for initiation ofmethyl-directed DNA mismatch repair to correct mistakes made during DNAreplication in Escherichia coli. MutH cleaves a newly synthesized andunmethylated daughter strand 5' to the sequence d(GATC) in ahemi-methylated duplex. Activation of MutH requires the recognition of aDNA mismatch by MutS and MutL. We have crystallized MutH in two spacegroups and solved the structures at 1.7 and 2.3 A resolution,respectively. 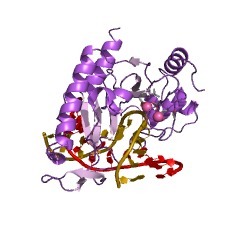 The active site of MutH is located at an interface betweentwo subdomains that pivot relative to one another, as revealed bycomparison of the crystal structures, and this presumably regulates thenuclease activity. The relative motion of the two subdomains in MutHcorrelates with the position of a protruding C-terminal helix. This helixappears to act as a molecular lever through which MutS and MutL maycommunicate the detection of a DNA mismatch and activate MutH. Withsequence homology to Sau3AI and structural similarity to PvuIIendonuclease, MutH is clearly related to these enzymes by divergentevolution, and this suggests that type II restriction endonucleasesevolved from a common ancestor.